2015 Children’s Laureate Alison Lester and Anna Walker shortlisted for Early Readers Book of the Year. Comments Off on 2015 Children’s Laureate Alison Lester and Anna Walker shortlisted for Early Readers Book of the Year. Mask makers Alison Lester, and Anna Walker were among those wonderful creators named on the CBC shortlist for the 2016 Book of The Year awards last week. 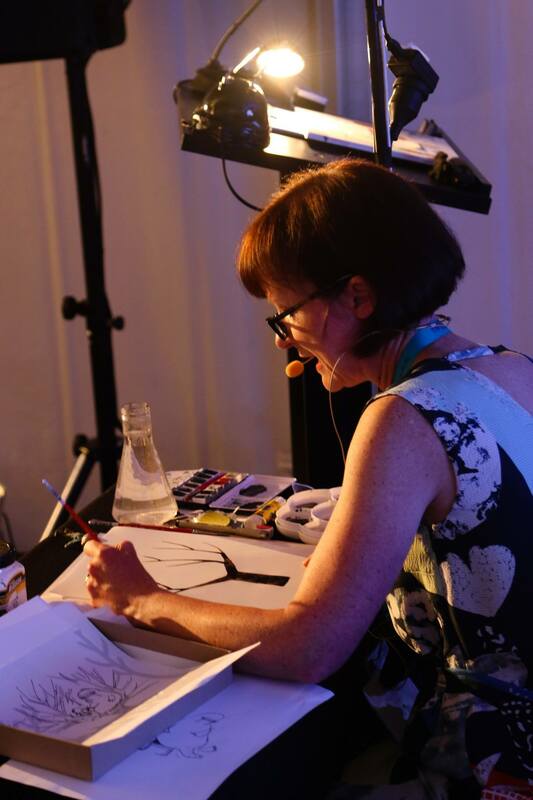 Below, Anna is pictured demonstrating her meticulous work to a rapt audience last year at the Celebrate Reading Conference at the Fremantle Literature Centre. Anna was shortlisted for her book Mr Huff. Like Anna, Alison Lester was also shortlisted for writing and illustrating Mr Bigsy. 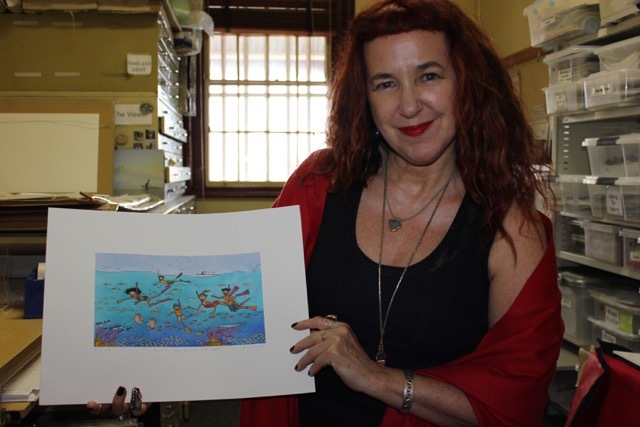 Below is a print of Alison Lester’s wonderful artwork which can be seen at the Fremantle Literature Centre. If you happen to be on the East coast and can’t get to Fremantle why not visit Geelong and visit to the magnificent new Library, where you can see all 22 of the masks that make up the Unmasking the Wild exhibition in the wonderful case the library purchased to give them a home until their new owners bear them away. 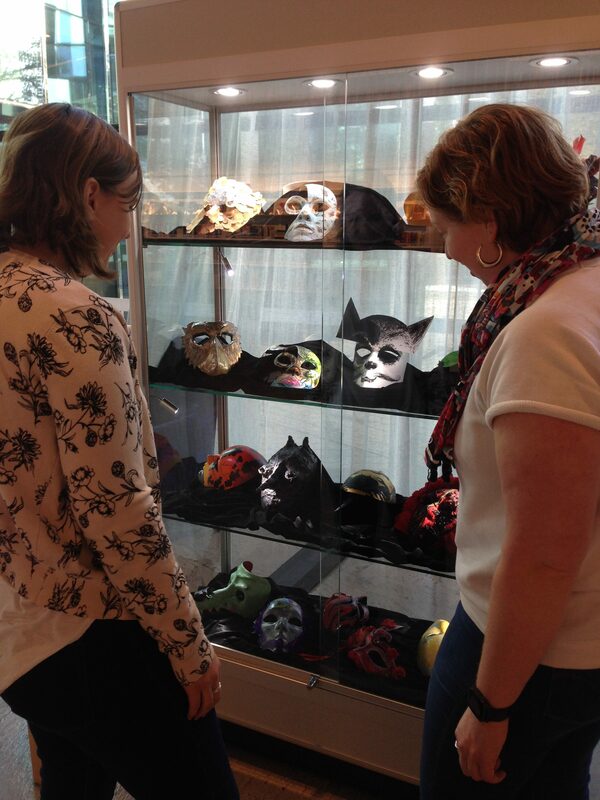 Pictured below, the masks in their case are proving a wonderful draw as visitors try to match the masks with their makers. Wy not make a bid and maybe win yourself a mask by a winner of Book of the Year, while supporting a sanctuary that houses abused bears and the sending of books to children in Crisis!